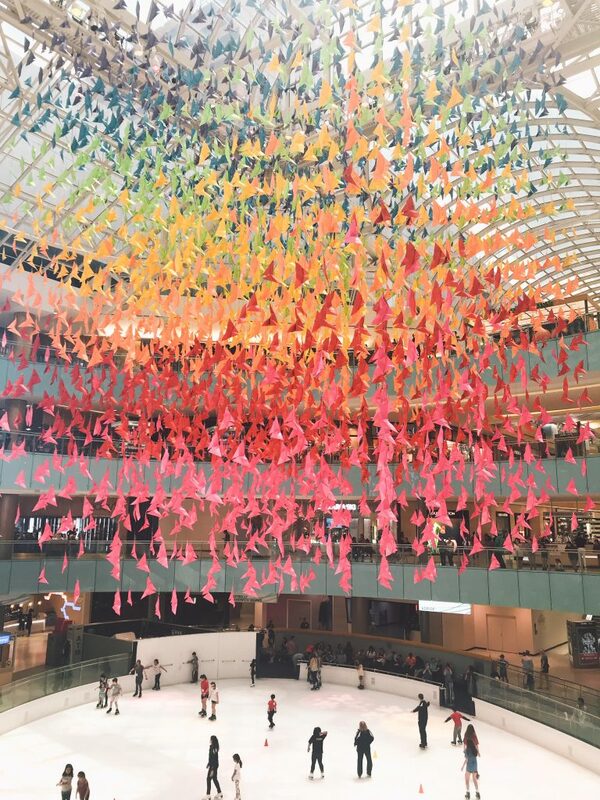 Whether you’re watching your budget or just tired of watching the TV, you don’t have to look long or hard for things to in North Texas. 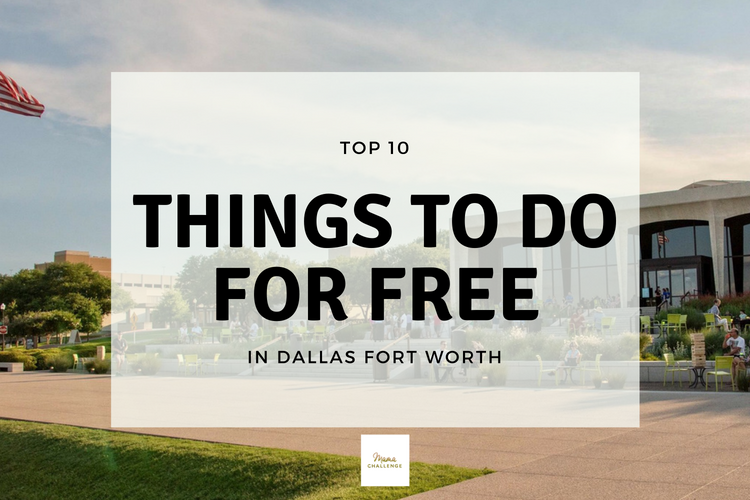 Here are some of our favorite Top 10 Free Things to Do in DFW. I’m all about getting the kids moving especially in the summer. 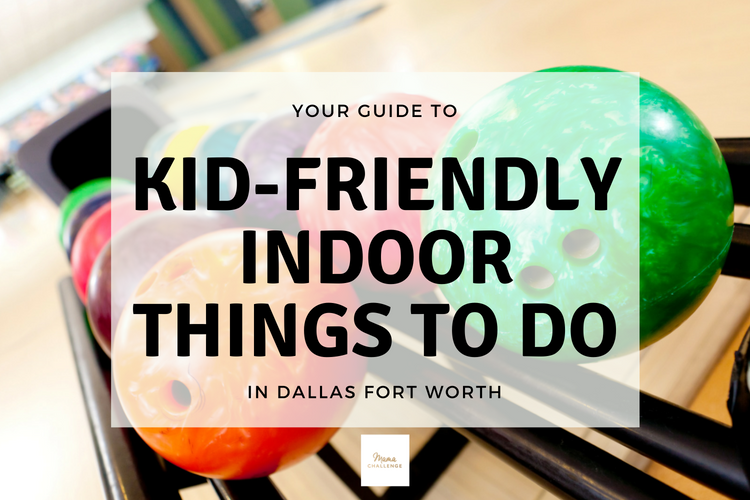 With Kids Bowl Free – kids can get 2 free games of bowling all summer of the program from bowling centers across the country and many of them in DFW. All you have to do is get registered for free and they’ll send your tickets on Sundays for the whole week! KidsBowlFreeAfterShow from Darin Spindler on Vimeo. When we went, there weren’t just families there, we found adults of all ages waiting to see the planes take off and come in from a great vantage point. Dedicated to the founders of DFW Airport in 1995, the plaza provides convenient parking, picnic tables, telescopes, historic information, a commemorative monument and a radio that broadcasts air traffic control communications from the FAA tower. Bring a picnic and spend the afternoon watching airplanes. Who doesn’t love LEGOs? Once a month at the LEGO store at Dallas’ Northpark Center, you can participate in a free mini-build! This event has limited space and time slots are available on a first-come, first-serve basis. Due to safety and build experience standards, builders must be between the ages of 6-14 to participate. The mini model must be completely built in store. 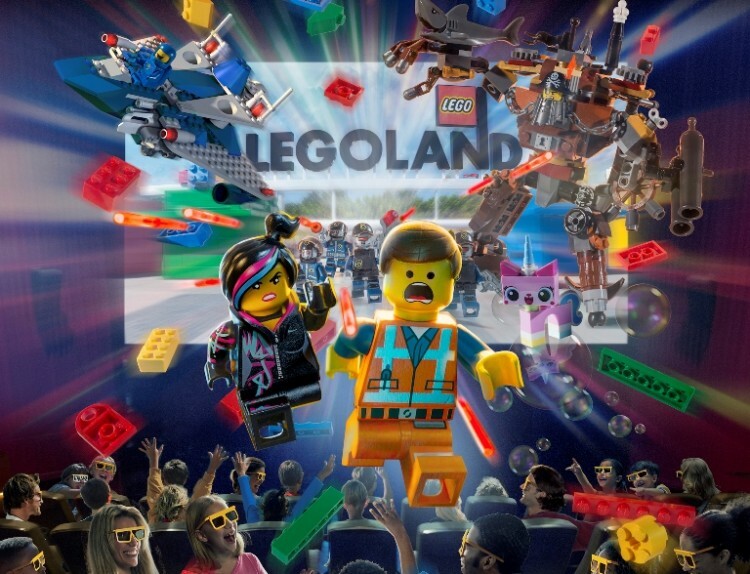 In order to sign up, guests must have a registered LEGO® VIP email address. If you do not have one you can create one for free at shop.LEGO.com/VIP. The August mini-build is a cute little snail! I’m a huge fan of outdoor concerts, enjoying the DFW sky under the stars (and in some cases under the stars) and listening to your favorite bands – and for free. 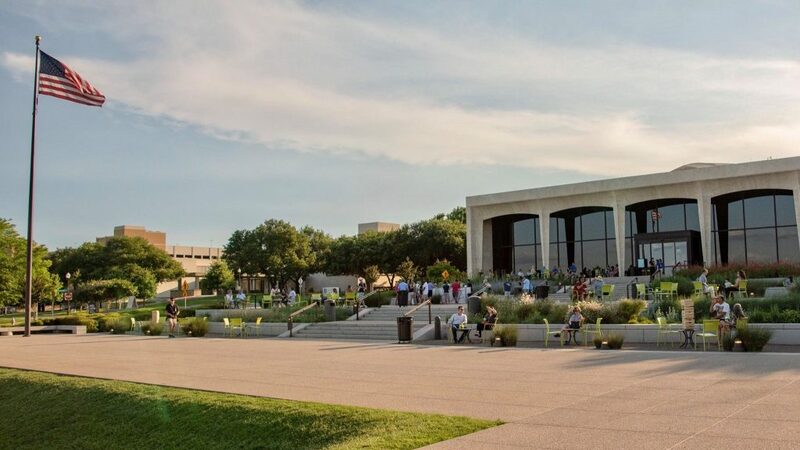 From Addison’s Summer Series, Arlington’s Levitt Pavilion, Fort Worth’s Rockin’ the River and Legacy Hall in Plano (and more), you can almost find a concert every weekend. One of my favorites’ is Levitt Pavilion in Arlington. Downtown you’ll find a beautiful outdoor stage that accommodates more than 100,000 visitors for more than 50 concerts a year. I love a good museum and in the summer when it’s not just hot or a good rainy day in the winter, there’s no better place to retreat than to immerse yourself in learning. Two of the best museums with free admission are the Dallas Museum of Art and the Amon Carter Museum in Fort Worth. You’ll find American art as well as free tours even for the kids. So don’t miss an opportunity to enjoy the art of some of their own outdoor programs throughout the summer, so head to their website for more on times and dates. Right in the middle of Dallas, you’ll find a 5.2 acre deck park over the highway with tons to do all year long. Open anytime, you can check out the programming like this weekend’s STEM in the Park, from 9 am – 3:30 pm. Nothing can make anyone feel like a kid again than watching fireworks. And Grapevine does a free 10-minute show (with a downloadable music soundtrack) every Friday night at 9:30 pm as part of their SummerBlast program, from Memorial Day to Labor Day. Viewing areas include Acorn Woods Park, the field next to Scott’s Landing Marina, Horseshoe Trails Park, Oak Grove Park (baseball, soccer and softball fields), Katie’s Woods Park, Lakeview Park and Rockledge Park for $5 a car. Thank you to our partners for providing giveaways for our MAMACHALLENGE readers! I love Texas but there are days when you just can’t do one more day outside. That’s when you head back into the precious sanctuary of air-conditioning, however, you still have to keep the words “I’m Bored” from being uttered. So here are some of our favorite ways to escape the heat (and some giveaways to boot!) Plus see our secret how you can get into many of them with one pass and save money all at one time! Kids love the 2-story Butterfly House where tropical butterflies dance around. They have a playground, puzzles, and coloring galore! Plus, some fun shows and activities that will keep the kids busy all day. This aquarium is so good, you won’t believe you’re in a mall. I’m talking sharks, rays, seahorses, and more! 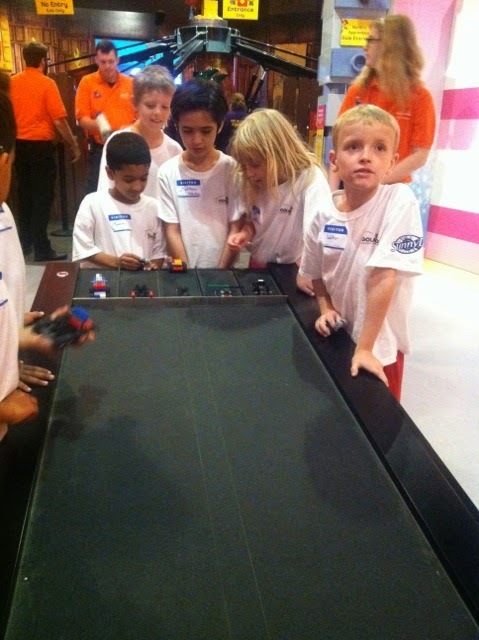 Kids can race LEGO vehicles, watch 4D movies, and build tall towers on their Earthquake Tables! Talk about an indoor adventure. Head to the museum on Thursdays from 10:30-12 for artmaking, art discovery, and story time! This museum has stuff for both you and the kids! Check out their 9-11 Tribute while the kids head over to the Children’s Museum where they can play all day. Let’s be honest, we like shiny things just as much as our kids do. Go check out all of the fabulous things made from gold at the DMA’s newest exhibit. Painting with a Twist is totally kid-friendly now! Check out the nearest classes to your neighborhood. Canvas isn’t all you’ll paint on at Board & Brush. In fact, they prefer, you guessed it – BOARDS! Let the kids get messy and create a masterpiece. Surely you need a new whatchamacallit for your bathroom counter, right? Because sometimes you just want your kids to get really tired so you can sleep through the night. For the kids that love a thrill, and parents that like to give themselves a minor heart attack. For those REALLY hot days that you need a serious cool down. There are literally trampolines everywhere at this place. No fluff but the kids love it. This little slice of nostalgia is just as much for you as it is the kids. Did someone say Burgertime? Just pay $10 to get in then let them play all day! They have over 95 games. 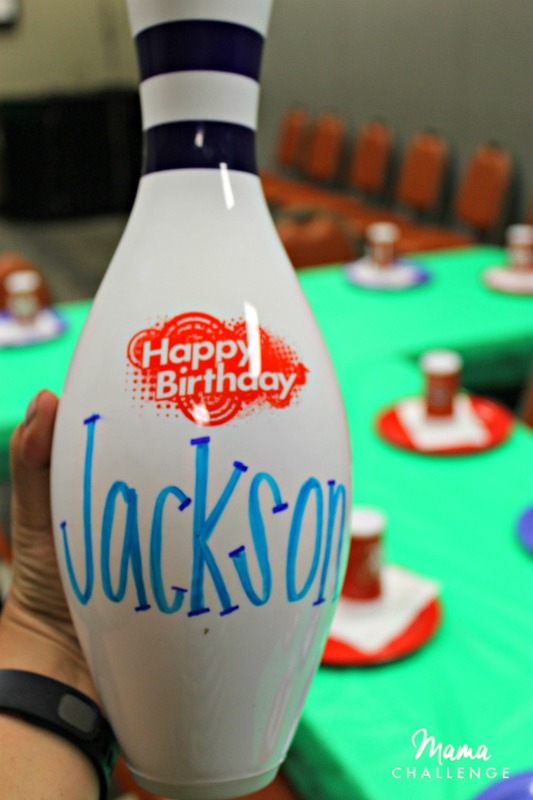 Bowling, games, rock climbing, and air conditioning – what more do you need? Old faithful never really gets old! Fun for the whole family! Let them play their games while you grab a bite to eat and maybe a well-deserved glass of wine. 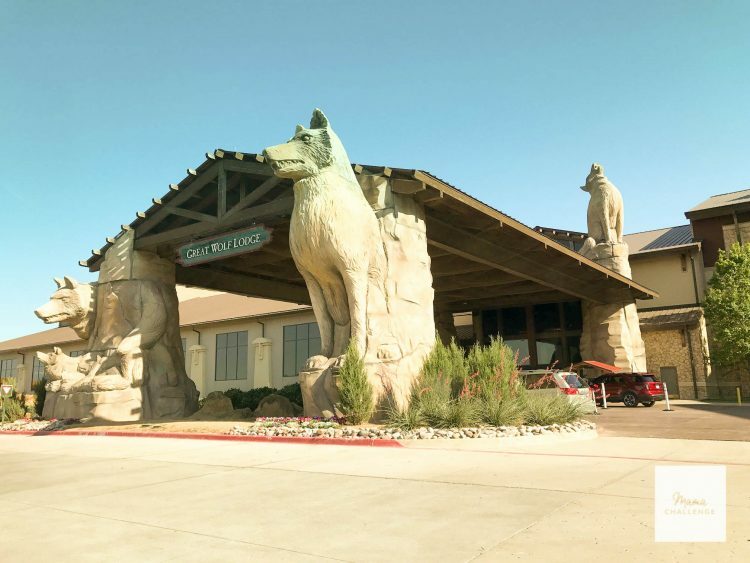 Bowling, an arcade, and a pizza buffet will literally keep the kids distracted all day. This place is massive and brand new! Come here once and your kids won’t want to leave! If you’re in need of a staycation, this is the place to go! Plus it’s a one-stop shop with activities, restaurants, and a place to lay your head while the kids are running around with their magic wand. This one’s for your older kids who love figuring out puzzles! 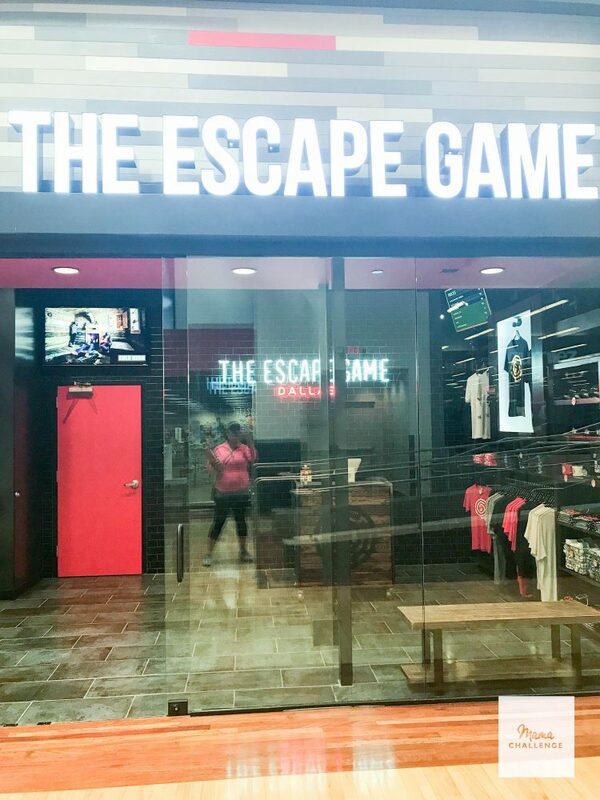 They’re rated #1 on Yelp for Escape rooms for kids for a reason – great customer service and challenging scenarios. 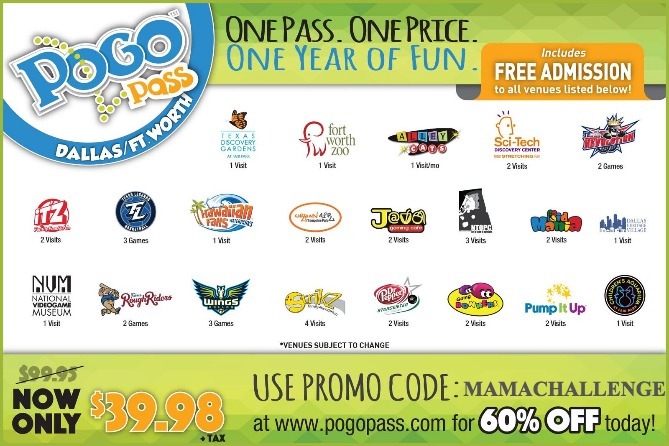 Be sure to use Promo Code: MAMACHALLENGE at www.pogopass.com for 60% off! 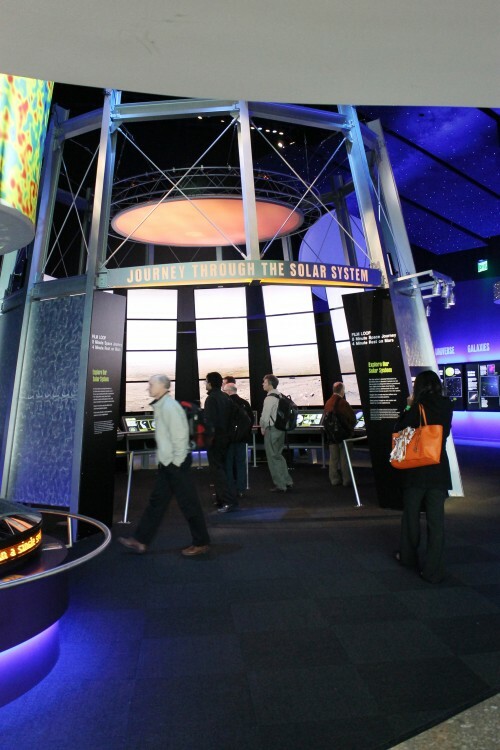 Enter these giveaways for a chance to win tickets to the coolest attractions! Arlington may be a sports fans dream, but May 22 – August 23, Globe Life Park becomes the Land of Oz – in a whole new way…in Sand. Fantasy in Sand featuring The Wonderful Wizard of Oz is a unique family experience that tells the story of characters we all know so well — Dorothy, Toto, the Wizard, the Wicked Witch of the West, the Scarecrow and more — through intricately carved sand sculptures, some of which are 20 feet tall. 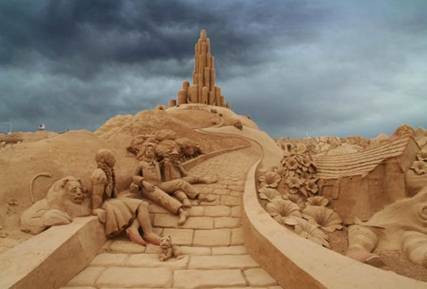 Currently, internationally renowned sand sculptors are carving 3 million pounds on sand into 16 scenes from L. Frank Baum’s famous book, including the Cowardly Lion, the Flying Monkeys and the Emerald City of Oz. The finale is called America the Beautiful and will feature the Lincoln Memorial, Statue of Liberty, Mount Rushmore and other American landmarks. The experience concludes with a Texas-sized sandbox, which is 2,000 square feet, where children can create their own sand sculptures while parents watch from an observation deck. 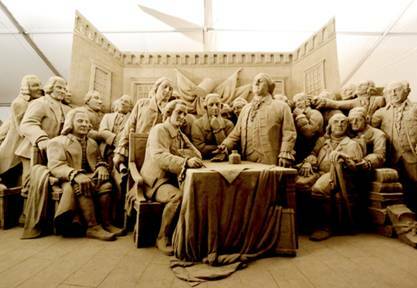 This is the largest indoor sandbox in Texas. Fantasy in Sand is enclosed in an enormous air-conditioned tent for the guests’ comfort and includes the necessary amenities: parking, accessibility for strollers, ADA compliance for wheelchairs, restrooms and a snack bar. More information about the event, including tickets and hours of operation, is available a www.FantasyInSand.com. The experience will stay open late on weekend nights when the Texas Rangers play home games so baseball fans may enjoy both events while in Arlington. And MamaChallenge.com is getting a sneak peek at what to expect tomorrow May 21 before the exhibit opens to the public, so make sure to follow me on Instagram for this exclusive look! What I wouldn’t give to be a kid and go to summer camp! My son is already signed up for some of the coolest camps including outdoor adventure camp, cooking camp, karate camp and even golf camp. Then I found two more that sounded like so much fun, but he’s just not old enough. However, yours might be just be the right age, so I highly suggest getting registered ASAP! Kids who love LEGO will love summer camp at LEGOLAND Discovery Center Dallas/Fort Worth. Along with Sunny Delight, kids ages 6-11 will have a chance to further their love of LEGO bricks through interactive team builds where they get to work hand-in-hand with the model building team. Additional activities include free play and team games in the attraction as well as a Sunny Delight snack break. All kids will receive one FREE Annual Pass and special goody bag with t-shirt. I still wish I could have gone to Space Camp growing up, but I’ve found the next best thing. Eagle Aviation Camp is a great opportunity for children to experience a one-of-a-kind adventure into the world of aviation. Fifth through 8th graders can experience the world of aviation through a week of tours of aviation facilities along with fun and educational activities. Kids will meet aviation professionals while sharing their perspectives and stories as they explore aviation. 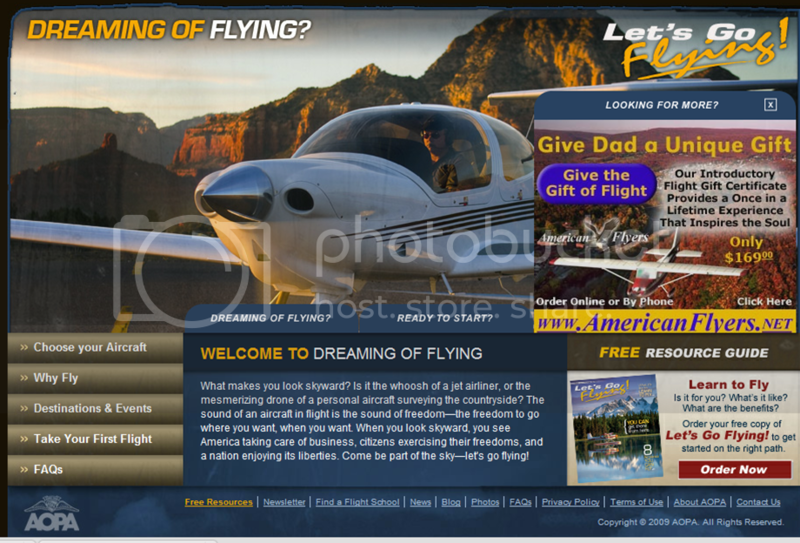 Did I mention flight simulators, too? Transportation for field trips for flight themed attractions like birds at the Zoo. Just make sure to sign up now – registration deadline is MAY 24! June 9-13, June 16-20 & June 23-27/8 am – 4:30 p.m.
Disclaimer: I was provided tickets to giveaway for you to The Grapevine Vintage Railroad for Day Out with Thomas™: The Thrill of the Ride Tour 2014. 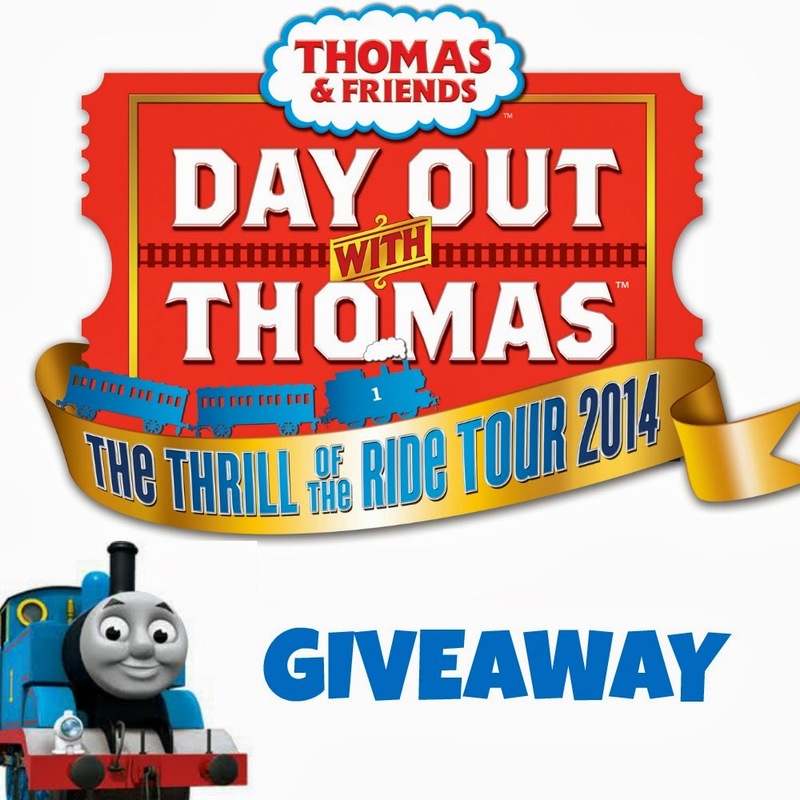 READ MORE ABOUT Day Out with Thomas™: The Thrill of the Ride Tour 2014 on Mom2MomDFW! The countdown is on! A week from today we’ve got Thankgiving and then the most crazy of Holiday events, Black Friday. And there’s lots more where that came from! 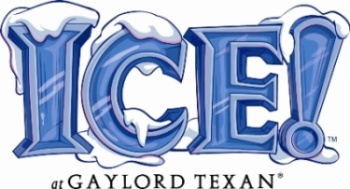 Just wait until next week and I provide an insider’s look at the Gaylord Texan’s ICE! To-Do: Here’s the first of your Holiday Helpin’! This has been a power-packed week of events with my birthday, Halloween and a pending holiday. The smiles on my kiddos’ faces and a late bedtime verifies that 2012 was a good Halloween, so like any good mom I’ll share a few shots from the best of the evening. However, it’s all about looking forward, so I’m putting my star on a few events this weekend to officially celebrate the next two months of HOLIDAY! Can you believe we are already in the home stretch? Now that I’ve officially scared you (and me), no need to worry! 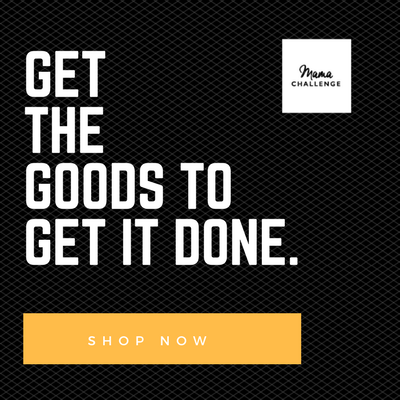 Mamachallenge.com is going to help you get that gold star for HOLIDAY 2012. Whether you’re looking for gifts, recipes or things to do, we’ll bring ’em to you. So just stay tuned to here AND do subscribe to 100 Days to Holidays newsletter from Parents. It’s always one of my must-dos and it’s a great way to get ideas for the holidays that make you look like a Martha Stewart without the jailtime. Do something with the leftover Halloween candy with a little help from Steve Noviello! As a proud resident of Arlington, I love when I can attend and recommend worth-while events in my own backyard. After Dark in the Park, Oct. 5 – 7 from 5 p.m. – 9 p.m. is one of them. 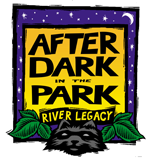 Designed to create awareness of the River Legacy Living Science Center environmental-education programs, After Dark in the Park is an annual family-friendly fall festival that includes fun family programming from ages 2 – 10 years old. It comes at a perfect time of the year when you start burning those pumpkin candles and thinking about the holidays. My favorite part is that the event is just the ideal size to enjoy with a young child without feeling overwhelmed or like you’re missing something. And since entrance includes a hayride shuttle from River Legacy Parks to event entrance, that’s almost worth the experience all together. 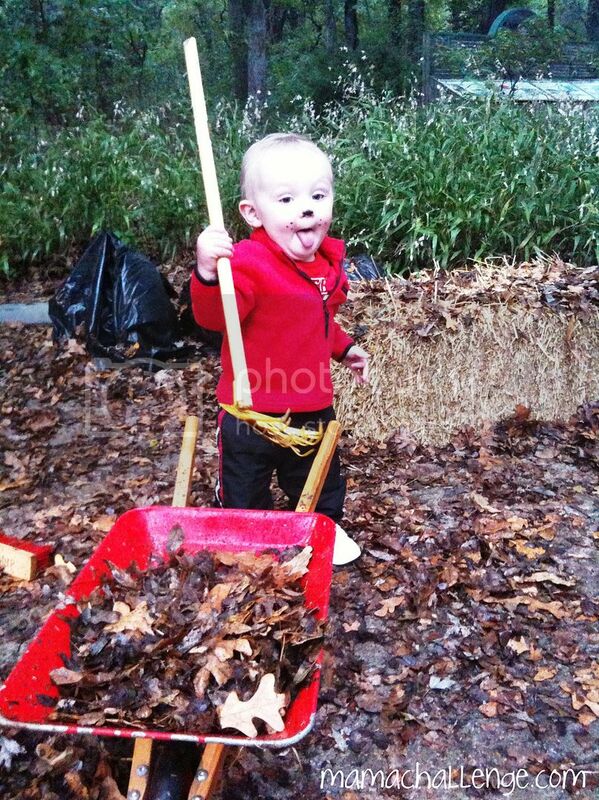 Here’s an old shot of my then 2 yr. old enjoying the simple fun of leaves at After Dark in the Park. · NEW for 2012: Bass Pro Camping Demo & Contests & Drawings for GREAT Prizes! Oct. 5 – 7, 2012 from 5 p.m. – 9 p.m.
Bring extra cash for tickets and some activities. Want another mom’s view on After Dark in the Park? 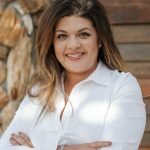 My friend Shannon of milkandcuddles.com and her daughter attended last year and she shared her experience on She is Dallas. Last-Minute Daddy’s Day Ideas + Giveaway! Like Mother’s Day this year, this Father’s Day couldn’t have come at a worse time. Really. Heavy planning is already underway for the four-year old’s birthday bonanza (much more to come), family begins arriving Friday and then it’s the big day. Since I’d already used the Pinterest Father’s Day candy card idea for his birthday last month, I was going to have to expand my horizons. Luckily a few good emails came across that not only saved me some time, money and even made me look like a superstar. 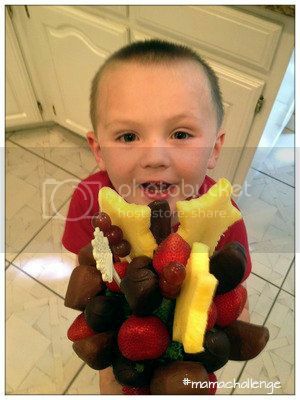 See below for a special giveaway from Edible Arrangements! 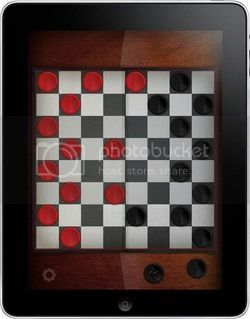 Probably already one of your favorite apps on your Iphone, Game Table is excited to announce that this Father’s Day they will debut their free #1 ITunes downloadable app Game Table Free now for Ipad. If FREE didn’t grab you, then the fact that for every 10,000 downloads, Label Interactive will donate $1,000 to the Children of Fallen Patriots Foundation, up to $10,000 should. Children of Fallen Patriots Foundation provides college scholarships and educational counseling to military children who have lost a parent in combat or accident. So give dad a few hours to himself to play the app in peace and quiet. That means this little gift doesn’t cost you anything but a smile and few clicks on the Apple. Hopefully this gives you a few ideas for Dad’s Day without banging your head or breaking the bank. And to all you Dads out there, especially mine – HAPPY FATHER’S DAY! 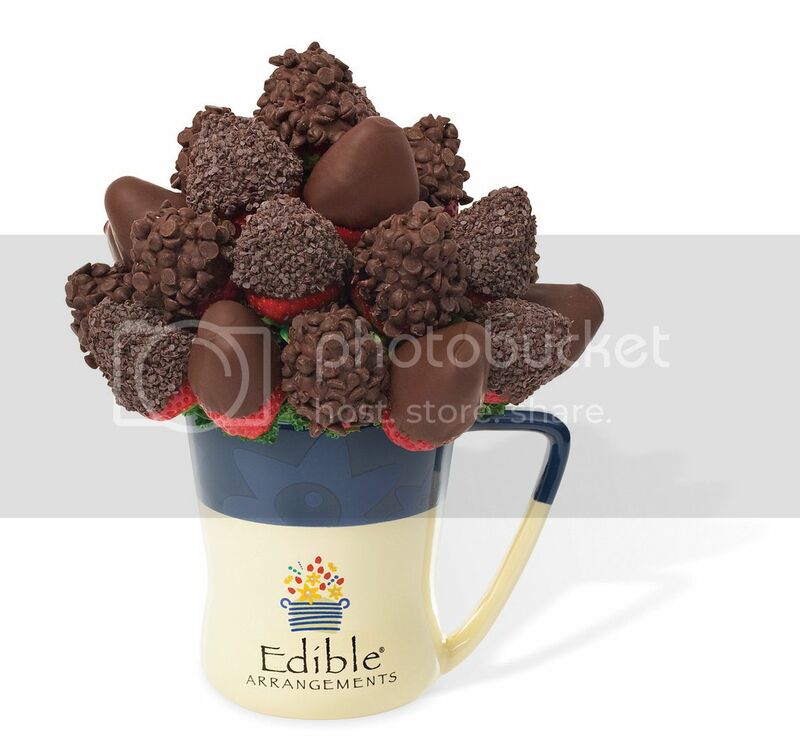 And to make it even sweeter, we have a great giveaway from EDIBLE ARRANGEMENTS ($69 value)! a Rafflecopter giveawayDisclaimer: I was provided an Edible Arrangement for purposes of this review, however, all the views included here are my own.